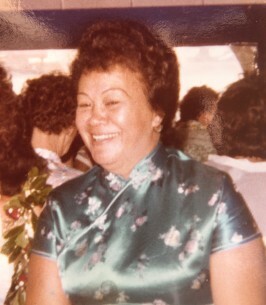 Marvi "Dolly" David, 80, aka Marie Louise Kaimimoku, passed away on March 10, 2019. She was born in Honolulu, Hawaii. She is survived by Sons Timothy K-Aloha, Solomon K-Aloha and Johnny K-Aloha, Daughter Isha Mok, Grandchildren Matthew K-Aloha, Abraham K-Aloha, Joshua K-Aloha, Andrew K-Aloha and Avern K-Aloha. Celebration of Life services will be held on Saturday March 30, 2019 at Susannah Wesley Community Center 1117 Kaili Street Honolulu, HI 96819. Services will be held from 9 a.m. to 1 p.m. Casual attire. To send flowers to the family of Marvi "Dolly" David (Kaimimoku), please visit our Heartfelt Sympathies Store.